Provide comfort for the family of Kathleen Horch with a meaningful gesture of sympathy. 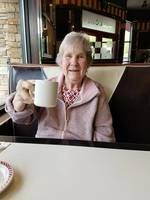 Kay Horch, 83, died 31st January 2019 at Vassar Brothers Hospital in Poughkeepsie, NY. She was surrounded by her children. The day she was born in Corona 1935, her father weathered a snow storm to bring the doctor back for the home delivery; as she departed, her children traveled through snow squalls for one last toast of wine with their life-of-the-party mother. No service at this time. To honor her, donations can be made to a charity of your choice in memory of Kay, OR one of her favorite things: South Huntington Public Library, Cinema Arts Centre (Huntington), Family Service League (Huntington). Daughter of Osbourne and Kathleen, sister to older brother Richard, Kay was born to be a caregiver. In childhood she nursed her ailing aunts and uncles or performed for them earning a nickel a song. While at Mary Immaculate School of Nursing in Jamaica during the 1950’s, leaving for a short time to assist her mother after the sudden loss of her beloved father, she met her husband Joe and best friend--soon to become sister-in-law--Barbara. Newly married, Kay joined her husband at Wright Patterson Air Force Base in Ohio; there her first two children were born. The young family later settled in Huntington, LI where three more children made a cozy family of seven. On a budget, Kay raised her five children, lavishing them with love (and stitches for those active boys—thank goodness for fantastic neighbors!) How she found the time or energy to go back to school part-time, earning a Bachelor of Science in Nursing from Stony Brook University, is still a wonder. She held several nursing positions over the years, yet truly devoted herself to her children first, taking off from work for high school soccer games. Kay eventually retired from the LI Blood Bank as a unit supervisor. Sounds of Kay, in laughter or story, came up the stairs Saturday evenings, lullabying her kids to sleep while she gathered with friends around the table for fun and games. Many a party did she host for every occasion! She instilled genuine hospitality and a deep sense of spirituality in her kids as well as a great love of music. From classical on Sunday mornings, prairie homes on Saturday, and folk music in between, she loved it all--weaving and Grateful! Kay cheered on her grand clan at soccer games or graduations up and down the East Coast. She attended science fairs, school concerts or town performances, always ready to sing along or ring her cow bell. In retirement between visits with family, she and Joe traveled with close friends-- heli-hiking in the Canadian Rockies, cruising on the Danube, and beyond. With her James Street gang, she put miles on her shoes walking the streets of Northport, always finishing with breakfast at the Shipwreck diner. Kay is predeceased by her husband (7 months shy of their 60th wedding anniversary), her brother and granddaughter Alissa. She is survived by her 5 married children and 15 grandchildren. Consider providing a gift of comfort for the family of Kathleen Horch by sending flowers.